GiLoCatur and family just got back home from kampung after a busy weekend having a wedding ceremony of sister in-law. We would have a short break before having another family program. Immediately after arriving home, GiLoCatur went online to chess-results.com. GiLoCatur would like to know the results of the on-going Asian Amateur Open which Malaysia is hosting. Apparently, 110 chess players from eight different countries are participating. The majority is from Malaysia with 77 number of participants followed by United Arab Emirates or UAE (15) and Singapore (10). Three rounds had completed. The fourth round is under way while GiLoCatur is writing this entry. The results are interesting and unpredictable. The top three seeds are not among the top 5 tables. In GiLoCatur's eyes, Haslindah Roslan, Chek Kin Keuw and Mohd Ezmi Mahmood recorded the most interesting results. 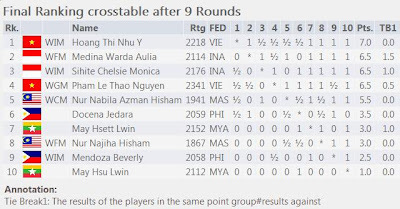 With Elo ratings of 1658, Haslindah managed to win against higher-rated opponents - Bernard Ng (rated 1999) and Shrestha Rajendra Prasad (rated at 2040), in the second and third round respectively. She is among the perfect 3/3 scorers. Having national ratings of 1641 and no FIDE ratings, like Haslindah, Kin Keuw won all his rounds so far. In the first round, he beat Mooi Kok Onn Osric who has 1900s Elo ratings. Then, he won against Syazwan Zulkifli (1993) in the second round. Then, in the third round, Amri Ibni Hajar who is rated at 2010 became his next victim. Still without FIDE ratings, Mohd Ezmi upset Chan Mun Fye in the first round. Then he defeated Malaysian veteran chess player, Lim Kian Hwa in the second round. Ezmi's sterling performance ended when he played Mohd Nabil in the third round. In the first round, about eight unrated players beat their rated opponents. Besides the opponents of the above three players, both Roshan Ajeet and Fairul Yusoff were among the unlucky rated players to be defeated. The former was beaten by Foo Che Kin while the latter went down to 13-year-old Harleiff Hanif. In the second round, three unrated players won over their rated opponents. Both Chuah Yi Ning and Kelly Lim Pei Ying joined Chek Kin Kuew to win over their respective opponents. While in the third round, six rated players went down to their respective opponents who have no FIDE ratings yet. In this round also, Ahmad Fadzil Nayan, the 12th seed, defeated his first seed opponent. Would it be more surprises in the tournament? Just wait and see. Best of luck to all Asian Amateur Open participants! Tomorrow, Saturday 26th November 2011, 8.00 am. Turn on your TV channel to RTM TV2. Finally, the Malaysian National Junior Chess Championship or simply known as NJCC, the fourth edition, is confirmed to be held from Monday, 19th until Friday 23rd December 2011. GiLoCatur received an email with the entry form and details of the tournament from Mr Greg Lau, the Malaysian Chess Federation (MCF) secretary, sent yesterday. Time Control : 90 minutes + 30 seconds increment from move 1. All moves must be recorded. ENTRIES AFTER CLOSING DATE WILL BE ACCEPTED ONLY AT THE DISCRETION OF THE ORGANIZERS AND A LATE PENALTY (RM 50) WILL BE CHARGED. MALAYSIAN CITIZENS ONLY CAN PARTICIPATE IN THIS TOURNAMENT. GiLoCatur had a "teh tarik" session after work at a "kedai Mamak" in Putrajaya with a long-time-not-seen buddy. 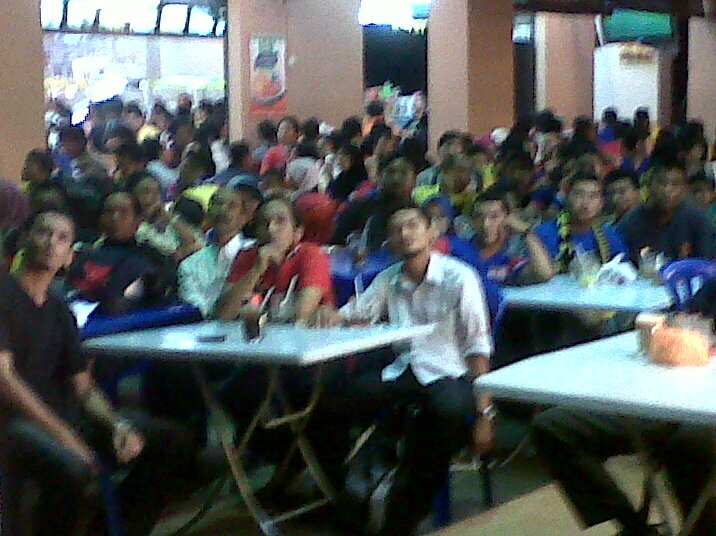 Check out below pictures, how passionate the Malaysians are when it is a football final match. No doubt, football is the number one (numero uno) sports among the Malaysians. It is envied by other sports like chess. Malaysia defended the gold medal it won two years ago. Malaysia beats Indonesia, the host country, in the penalty kick after 1 - 1 score during normal 90-minute playing time and goaless extra 30 minute. Congratulation to the Malaysian football team! Arrived home from work, immediately GiLoCatur went online to chess-results.com website. GiLoCatur would like to know the results of the Chess blitz event held today. In this event, Malaysia is represented by IM Mas Hafizulhelmi and Sumant Subramaniam in the Men category and Azman Hisham sisters - WCM Nur Nabila and WFM Nur Najiha, in the Women category. Philippines and Vietnam each won Gold medal in this event. 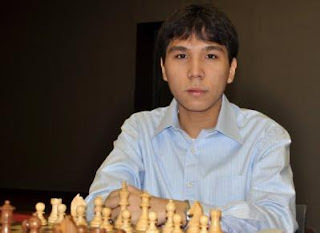 The only Gold medal in chess won by Philippines is contributed by its top chess player, GM Wesley So (below picture). He came back strong from his disappointment for not winning gold in the Men Standard event. Impressively, he won all his nine games including against the top seed, GM Nguyen Ngoc Truong Son of Vietnam. Truong Son got Silver while So's countryman, GM Mark Paragua, gave Bronze medal to Philippines. IM Mas was placed fourth with four wins, four losses and one draw. He had 4.5/9 points. Meanwhile, Sumant who is last in the starting list based on Elo ratings managed to win two games. 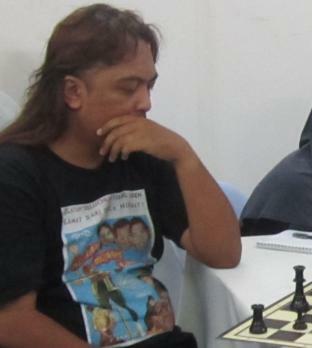 The two opponents he defeated are grandmasters - Mark Paragua of Philippines and Cerdas Barus of Indonesia. GiLoCatur hopes such wins will boost Sumant's confidence that he can beat masters. 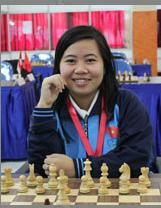 In the Women Blitz event, a Vietnamese Women International Master (WIM) Hoang Thi Nhu Y emerged the gold medallist. She won five games and drew the other four to record 7/9 points. It is the sixth gold medal in chess for Vietnam. Both Silver and Bronze medals went to the host country, Indonesia. Its chess princesses - WFM Warda Aulia Medina and WIM Chelsie Monica Sihite contributed the medals. Both of them had same 6.5/9 points. But Warda had better tie break than Chelsie. The Malaysian players are placed fifth and eighth. Nabila had 5.5/9 points while her younger sister scored 3/9 points. GiLoCatur believes the two young players are at par with other players even though they have the lowest Elo ratings. In next SEA Games, GiLoCatur strongly believe that both of them will provide medals to Malaysia. Congratz To The Malaysian Shooting Princess! 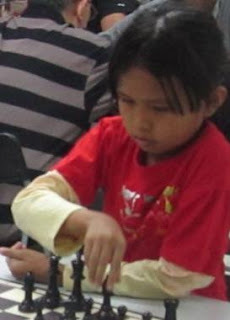 The Malaysian chess community needs a "Chess Princess" or Puteri Catur like Nur Suryani who is the Malaysian "Shooting Princess" or Puteri Menembak in the on-going 26th SEA Games to make chess stand tall in the Malaysian sports. Who among the four Malaysian female chess players will take the challenge? The 29-year-old Malaysian shooting princess had won TWO GOLD medals for the country. She won the first Malaysian Gold medal in the 26th SEA Games in the Women's 50m Rifle 3 Position event. Then, she won the second Gold medal in the Women 10m Air Rifle event. Syabas and tahniah to her from GiLoCatur! The Standard Chess event will start today at 2.30pm. Malaysia will be represented by IM Jimmy Liew in the Men category and 13-year-old Camilia Johari in the Women category. Based on the starting list below, only six contestants in the Men category and five contestants in the Women category. GiLoCatur strongly believe Malaysia has a good chance to win medal in both categories. The top and hot favourites to win the Gold medals in this event are GM Wesley So from Philippines for Men and WGM Irine Kharisma Sukandar from Indonesia for Women. Three events in Chess had completed. Vietnam has won two (2) Gold medals and Thailand has won one (1). Vietnam won Gold in Blindfold and Mixed Pair events while Thailand won Gold in Asean Chess. All matches start at 2.30pm except the fifth which will start at 9.00am. GOOD LUCK! to both Malaysian players. MALAYSIA won Bronze medal in the Mixed event (Chess) in the 26th SEA Games after recording 3 wins and scoring 6 Match Points (MP). Syabas and tahniah to the Malaysian Mixed pair, IM Lim Yee Weng and WFM Nur Najiha Azman Hisham. The feat is very important especially to the Malaysian chess community to put CHESS in the Malaysian sports map. It is also important to show that CHESS has potential for Malaysia. In the first round, the Malaysian Mixed pair was defeated by the Vietnamese pair Grand Masters. But Malaysia came back in the second round to win over the lower-rated Siamese chess players. Malaysia made an upset in the third round. IM Yee Weng showed his capability as grand master beater. He defeated GM Susanto Megaranto, one of the top players in the event. Click here to view his victorious game. The victory became sweeter when WFM Nur Najiha managed to draw with the strongest female player in this event, WGM Irine Sukandar. It is an important feat to the Malaysian mixed pair. Unfortunately, the Malaysian pair could not continue their sterling performance when played against the Philippines pair led by GM Oliver Barbosa. But they fought hard in the final round and won against higher-rated Myanmar pair. This time, WFM Nur Najiha provided the critical win. A draw by IM Yee Weng is enough to pip the Indonesian pair to claim the Bronze medal. GiLoCatur is not sure whether IM Yee Weng already knew the result of the Vietnam - Indonesia match. In the match, GM Thien Hai Dao won over his Indonesian opponent, but his pair WGM Thi Thanh An Nguyen could not against WGM Irine Sukandar. Thus, the Vietnam and Indonesia match ended draw. Below are the detail results for each of the Malaysian Mixed pair. GiLoCatur hopes Malaysia will win more medals in the other chess events. Best of Luck to all the Malaysian SEA Games chess contingent! MALAYSIA BOLEH! Vietnam grabs GOLD in the Blindfold chess event in the 26th SEA Games in Palembang. 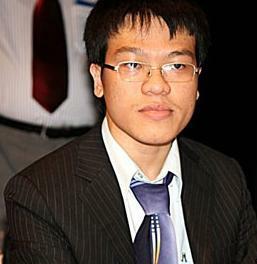 Its Numero Uno chess player, GM Le Quang Liem, scored 7/9 points to emerge as the Gold medallist. Both the Silver and Bronze medals went to The Philippines. Even though has same points as the champion, GM Paul J Gomez was awarded the Silver medal because GM Quang Liem has better tie break. With 5.5/9 points, GM Darwin Laylo provided the second medal for his country in this event. 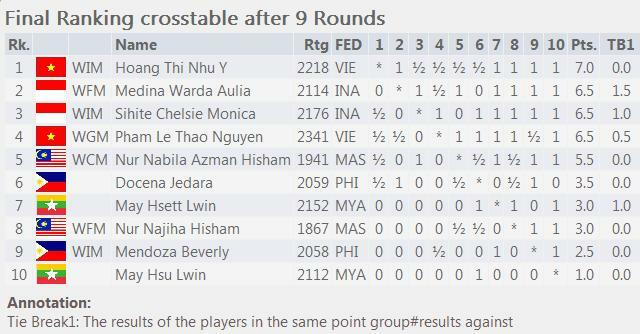 Below is the final ranking cross table after 9 rounds for the Blindfold chess event. Rapid is one of the events for Chess in the 26th SEA Games. Two GOLD medals are vied by six countries which participated. Surprisingly, Singapore does not take part. Vietnam is the hot favourite in this event. The players from this country dominate the starting rank list. In the men's category, Vietnam is represented by one "super" GM and "very strong" GM. Le With Elo ratings of 2714, Quang Liem is the hot favourite to win the Gold medal. He will be challenged by his country man, Nguyen Ngoc Truong Son who is at the second rank and the only 2600-rated player in the list. The Philippines' chess wonder boy, Wesley So, does not take part in this event. The country is represented by IM Oliver Barbosa and GM Rogelio Antonio Jr. While Indonesia, the host country, is represented by two FMs - Kasmiran and Hamdani Rudin. How about Malaysia? The Malaysian top player, IM Mas Hafizulhelmi who has Elo ratings of 2398, is ranked fifth. He is Malaysia's best hope to grab a medal in this event. IM Mas is accompanied by Sumant Subramaniam who is the second last in the starting list with Elo ratings of 2083. GiLoCatur hopes Sumant will play his best and has strong will and determination to make an upset. In the Women event, only 10 players take part. Both Myanmar and Thailand has only one player taking part. 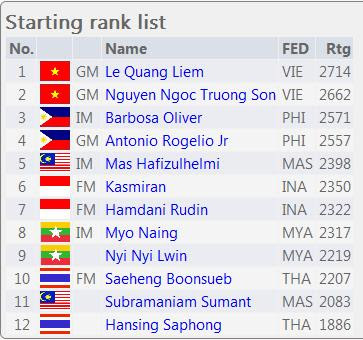 Two WGMs from Vietnam who have 2300s Elo ratings are the top seeds followed by two Indonesian players. The Philippines players are right above both the Malaysian players. 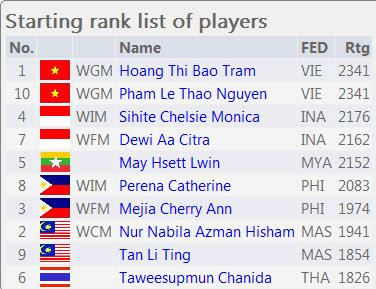 In the Women Rapid Chess, Malaysia is represented by WCM Nur Nabila Azman Hisham and WNM Tan Li Ting who are among the bottom three in the starting rank list. But GiLoCatur believes both of them have a chance to be on the podium. They must believe in themselves and be proud to play for the country. DON'T BE AFRAID! BE CONFIDENT! For this event, nine rounds will be played starting on 17th November and ending on 20th November. YAKIN BOLEH to all the four Malaysian chess players. MAKE MALAYSIA AND ITS CHESS COMMUNITY STAND TALL AND PROUD. Bravo IM Yee Weng N WFM Nur Najiha! After just completed reading a thriller novel titled PENUNGGU RIMBA TOMBIRUO by Ramlee Awang Murshid bought on last Sunday, GiLoCatur quickly went online to check on the results of chess Mixed pair event in the ongoing SEA Games. Six countries including Malaysia are taking part in the five-round Mixed pair category. Malaysia is represented by IM Lim Yee Weng and WFM Nur Najiha Azman Hisham. The former is the seventh seed while the latter is the second last seed out of total 12 participants. Today Round 3 had been held. Malaysia was paired against the host country, Indonesia. GiLoCatur is so glad and surprise that Malaysia won. The Indonesian pair - GM Susanto Megaranto and WGM Irine Kharisma Iskandar is the hot favourite to win the Mixed pair category. Syabas and tahniah to both Yee Weng and Najiha on the win. It shows that Malaysia Boleh! In the first round, Malaysia lost to Vietnam 0 - 2. Then, Malaysia came back in the second round to beat Thailand by 2 - 0 score. The fourth round is very important to Malaysia when it will be paired against Philippines which also won over Indonesia with the same score, 1.5 - 0.5. In a rapid chess tournament there would always have matches with drama or dramatic games. A dramatic rapid game where both players blitz when the time is critical and going to end. During such time pressure, mistakes and inaccurate moves are common even to players who spar a lot. One of the dramatic games in the 3rd Ole Ole Shah Alam Open last Saturday witnessed by GiLoCatur is the match between Max of 17ChessClub and his 1626-MCF-rated opponent in the fourth round. Playing white, Max just moved Qb2+ as per the above position. In GiLoCatur's opinion, piecewise both have equal pieces and pawns. But white has better position. Surely several minutes later, Max has the winning edge as shown by the above diagram. Black is one pawn down and need to defend its open King. Having less than one minute left on the clock, and having a King plus a Queen + a Knight versus only King for the black, Max blew the winning opportunity when the game became stalemate. The white Queen is at the 7th rank. 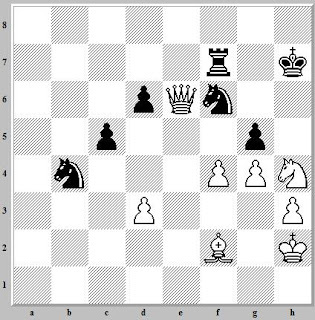 A knight is at the 6th rank and same file with the black's King. 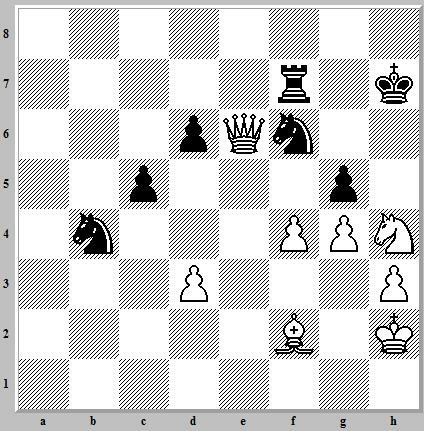 If GiLoCatur is not mistaken, white checks using a Knight, 1. Nf6+ Kf8! (the King is moved in front (same file) of the Knight. 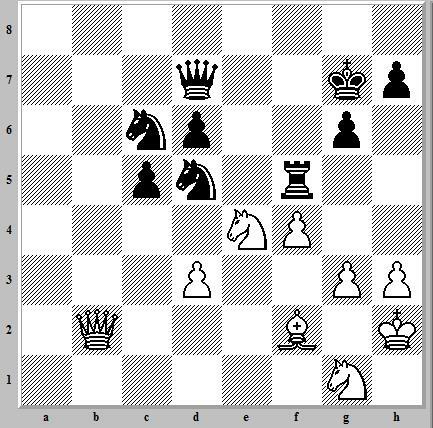 Out of the blue, white (Max) moved other pieces (either a pawn or the King); NOT the Knight to enable the black to move along the 8th rank. So, STALEMATE it is. Ayah dan amak doakan Fikri jadi anak yang soleh, belajau pandai-pandai, berjayo dalam pelajaran, berjayo dalam apo juo bidang yang diceburi, termasuok catur. Tunjuokkan contoh teladan yang baiok pado adiok-adiok, sayangi dan jago naangko du. 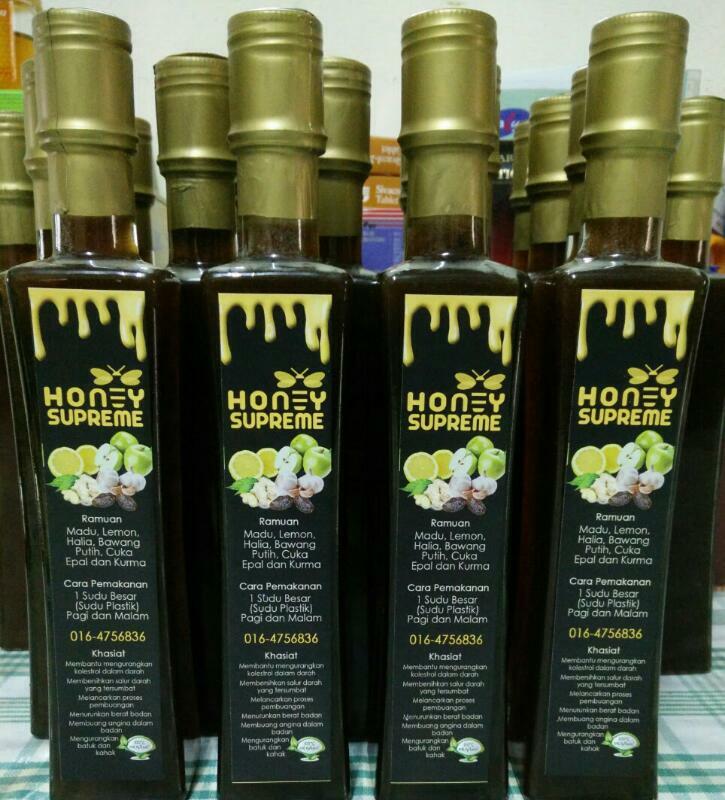 Hormati ughang tuo-tuo, para guru, respect kawan-kawan, jadi ikon pado adiok-adiok. Ingeklah, ibu dan ayah sentiaso mendoakan yang terbaiok untuok Fikri, anak suluong kami yang lahir pado tanggal hari ko 15 tahun yang lalu." 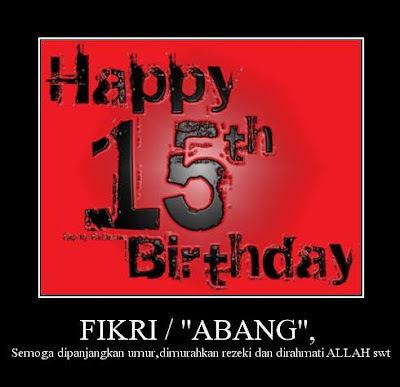 note : the above birthday greeting wish for GiLoCatur's eldest son, FIKRI, is in the KAMPARIAN dialect, our Malay ethnic. GiLoCatur was among the eighty (80) participants in the 3rd Ole Ole Shah Alam Chess Championship held today at the Ole Ole Shah Alam Shopping complex. 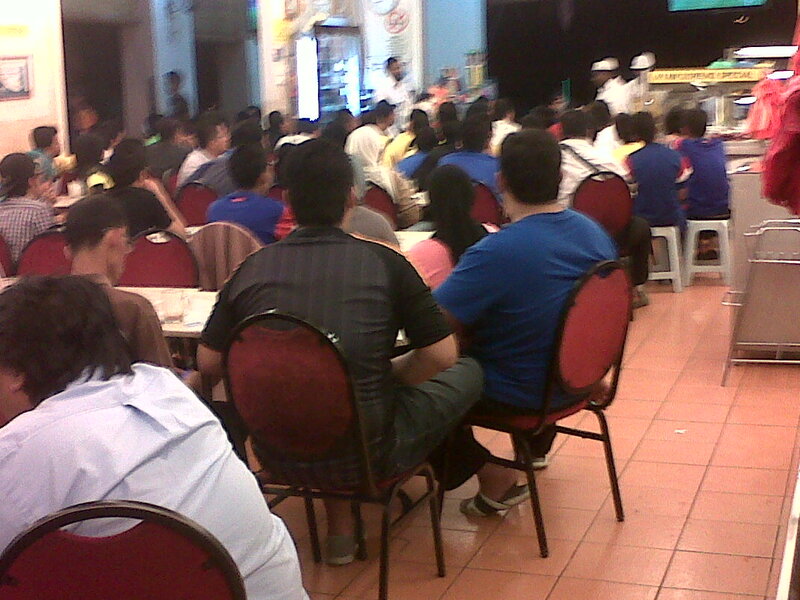 Some participants came all the way from Pahang, Kelantan and Johor to have fun playing chess in the tournament. Check out the photos below to see the faces of the participants during the tournament. In the final round, Akmal was playing on the second board against the 1st edition champion, NM Zarul Syazwan Zullkafli. Not bad, scoring 5/7 points for a player with 1541 MCF ratings and seldom participate in local chess tournament. GiLoCatur was told that Nik Nazri came by bus all the way from Kelantan. He is a school teacher there. GiLoCatur played Haji Salim, a 70+ years old veteran from Temerloh Pahang, more than three years ago in the Temerloh Open. GiLoCatur salutes his passion in playing chess. photo 8 - "Abang BRO"
The Shah Alam Member of Parliament (MP), Mr Khalid Samad is the guest of honour giving the prizes to all the winners. During his speech, he encourages the participants especially the youngsters to keep playing chess and gives his support for the chess community especially to IM Mas in his pursue of the Grandmastership. Go to the MP's website here to know more about him. About thirty Under 12 chess players took part in the 3rd Ole Ole Shah Alam Chess Championship including GiLoCatur's youngest child, Fahim Al-Faqeh. They played in seven SWISS rounds of a 20 or 25 minute rapid. Below are the picture report for such category. Nithya lives up to her top seeding to emerge as the champion to win a trophy and a hundred Malaysian Ringgit money prize. She won all her seven rounds and scored 7/7 points. Congratulation! In about 15 minutes, it would be all 1s. 11.11.11 at 11.11 which is 11th November 2011 at 11.11am and another 12 hours later at 11.11pm. GiLoCatur does not crazy about numbers. Neither into numerology. But today's date is simply unique, once in 100 years. Isn't it memorable if we do or have something special today? A friend will have a wedding ceremony today. He is an artist, a singer to be exact. Click here to know who he is. 11.11.11 is close to 13.11.11 right? What is so special on 13th November 2011? Actually, it is the birthday of GiLoCatur's son, FIKRI. He will be 15 years old. Click the following links if you want to find out the frenzy info about this date. Oh My God, No Chess Tournament In November For GiLoCatur & Kids? Oh My God. 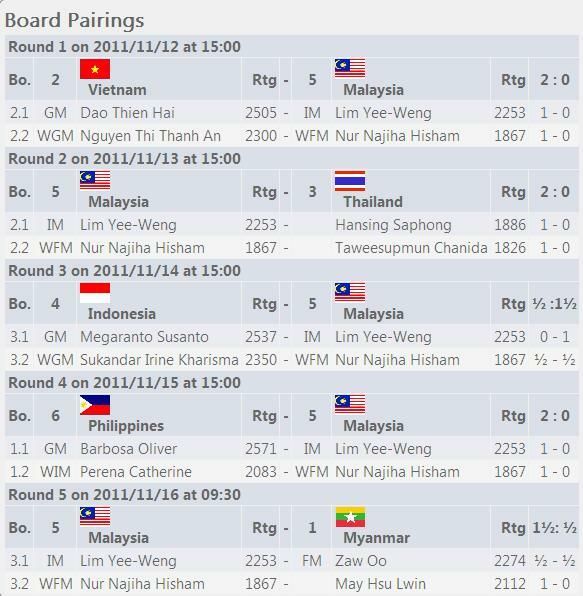 There are so many chess tournaments in Malaysia in the month of November. BUT GiLoCatur and the kids will miss all of them. In October, GiLoCatur and the kids had participated in chess tournament in all the weekends except one, the fourth, when went back home town. In the first weekend, both Anis and Fahim took part in the 2nd National Rapid Chess Championship (NRCC). In the second weekend, Fahim emerged as the first runner up in the 7th Insofar Junior Chess Scholarship tournament. In the third weekend, GiLoCatur scored 5/8 points in the 5th UPSI Open while Fikri had his first tourney after a break for PRM examination. Both Anis and Fahim were playing in their respective school categories. In the last weekend of October, both Fikri and Fahim took part in the Ampangan age group category. BUT in November, no chess tournament for GiLoCatur and the kids. So unbelievable eh. The kids will miss the National Scholastic Age Group Chess Championship (NSAGCC). GiLoCatur can't participate in the 3rd Insofar Open Scholarship chess tournament. Anis will have to wait longer to play in the Insofar Juniors Scholarship chess tournament. Fikri will miss the opportunity to play against top Asian amateurs in the Asian Amateur Open. The kids surely will also miss the opportunity to be at the Berjaya Times Square in the last weekend of November for its first chess tournament. The reason is there are important family functions and activities. The youngest aunt of GiLoCatur's kids is getting married this month. 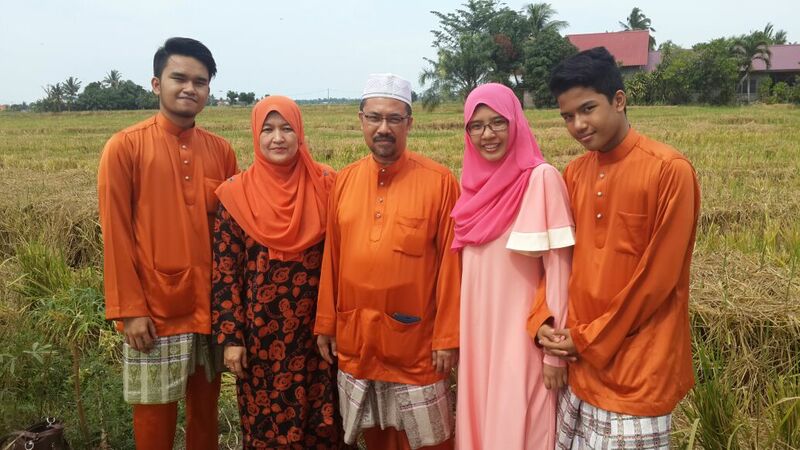 Their grandparents have urged and insisted GiLoCatur's kids to "balik kampung" to assist in the wedding preparation. Another "PUTERI Catur" In The Making! Another chess PUTERI or princess in the making? 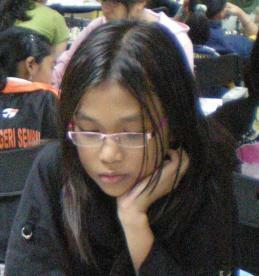 Below PUTERI is a well-known Malaysian chess player already. Last month, she won one GOLD and one SILVER for Malaysia in the 5th APSSO held in Jakarta. She is PUTERI RIFQAH FAHADA AZHAR MS.
Below PUTERI is also a popular Malaysian chess player. She is the younger sister of Puteri Rifqah. Among her achievements is winning for her country, THREE Golds and TWO Silvers in Girls Under 10 category of the 12th ASEAN+ Age Group Chess Championship last June. Click here for further story. She is PUTERI MUNAJJAH AZ-ZAHRAA AZHAR MS. The new PUTERI in the making is below four-years-old girl named PUTERI RABIATUL ADAWIYAH MAT ZAKI. Puteri Rabiatul has been chosen to represent Malaysia in the 7th Asian Schools Chess Championship to be held in India in this coming December in Girls Under 5 category. BUT SHE CAN'T PARTICIPATE IF HER PARENTS ARE UNABLE TO RAISE NINE THOUSANDS MALAYSIAN RINGGIT FOR THE EXPENSE. It is a hard reality for a Malaysian chess player. Chess is NOT a popular sport like football, tennis or badminton. The fund and sponsorship for travelling and lodging expense for international competition is difficult to get. For those who are interested to sponsor her to fulfil her dream, please call 012-3415030. Her plight is covered in the Malay Mail here. P/S: Actually, there is another Puteri that would enlighten the Malaysian chess in years to come. She was just born several days ago, on 1.11.11 to be exact. Congratulation to Azhar MS and her wife for their newborn baby girl, Puteri Dalisya Delisya Zhansaya (the last one sound familiar eh ... :) ).